Chocolate lava cake is a great hit. Who could pass on a delicious chocolate cake holding melted chocolate in the middle? Disney’s Contemporary Resort is home to great restaurants. 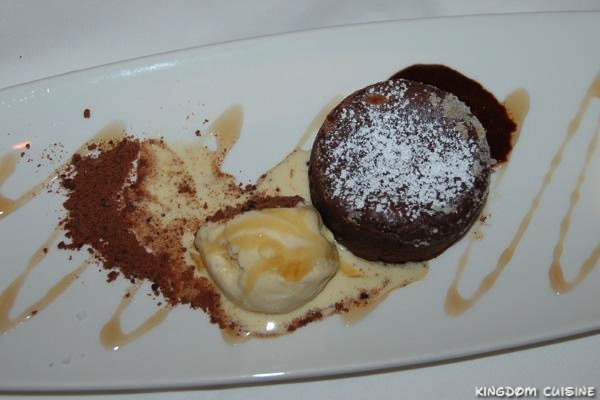 California Grill boasts a delicious chocolate lava cake that is very easy to make! Preheat oven to 375ºF. Lightly butter sides of 6 individual (3/4 cup) ramekins. Lightly coat with sugar, then shake out excess. Melt chocolate and butter in top of a double boiler set over simmering water. Stir until smooth. Remove from over water and cool 10 minutes. Beat egg yolks and whole eggs together in a large bowl. Add sugar and beat about 2 minutes, until thick and light. Sift flour, then fold into batter, mixing until smooth. Divide batter among prepared cups, filling 3/4 full. Place on baking sheet and bake about 35 to 40 minutes, or until sides of cakes are set and middle is still soft. Do not overtake. Using a small knife, cut around sides of cakes to loosen. Invert onto plates and serve with your favorite ice cream. You can also use muffin tins; recipe makes 12. Bake for 15 minutes, or until set and middle is soft. Have a magical dessert with this chocolate lava cake at California Grill, or make a Disneyfied dessert at home with this simple recipe!